November is celebrated every year as National Native American Heritage Month by the United States federal government. November is also a month rife with historical trauma for Native American peoples. WOUB’s Emily Votaw spoke with Dr. Victoria LaPoe, an assistant professor at Ohio University’s E.W. Scripps School of Journalism, the director of the Native American Journalism Fellowship, and the Vice President of the Native American Journalist Association; Jacob Stockwell, a non-Native volunteer with Black Mesa Indigenous Support; and Corine Fairbanks of the American Indian Movement of Ohio about the complex nature of the month. The entire interview is embedded above. 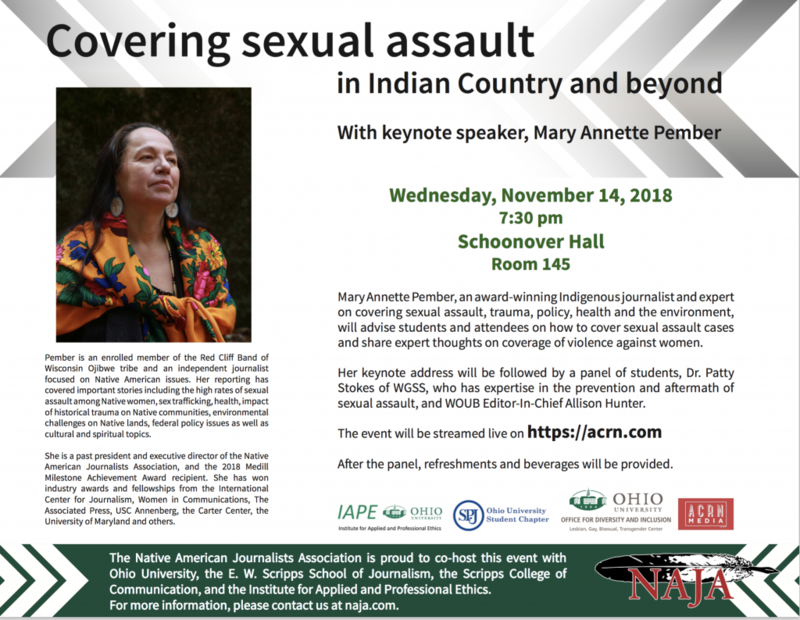 On Wednesday, November 14, Ohio University will mark Native American Heritage Month with an event entitled “Covering Sexual Assault in Indian Country and Beyond,” featuring keynote speaker Mary Annette Pember. The free event will begin at 7:30 p.m. in Schoonover Hall Room 145 on Ohio University’s Athens campus. The event was organized by Dr. LaPoe and is supported by WOUB, Institute for Applied & Professional Ethics, E. W. Scripps School of Journalism, E.W. Scripps College, ACRN, Women’s, Gender, and Sexuality Studies, Lesbian, Gay, Bisexual, Transgender Center, Office of Diversity and Inclusion, OU Multicultural Center, Black Student Cultural Programming, Scripps Hispanic Network, Student Affairs, OU Society of Professional Journalists, Scripps PRSSA, The Post Athens, The New Political, Graduate Student Senate, Survivor Advocacy Program and Survivor Advocacy Outreach Program. 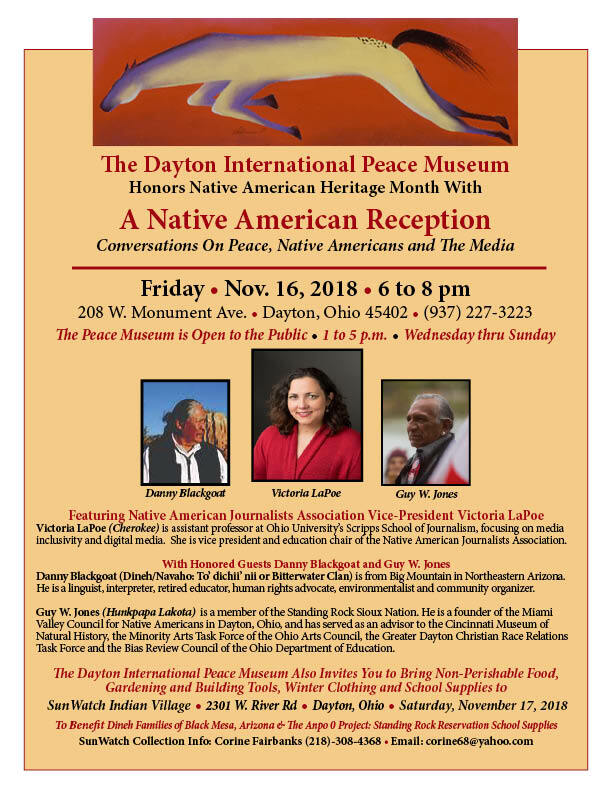 On Friday, November 16, Dr. LaPoe will be speaking at the Dayton International Peace Museum’s “A Native American Reception: Conversations on Peace, Native Americans and the Media.” The event is free and will take place 6 p.m. to 8 p.m., and will also feature Danny Blackgoat and Guy W. Jones. The event will take place at 208 West Monument Avenue in Dayton. On Saturday, November 17, Dr. LaPoe will also be at a benefit community luncheon held for the benefit of the Dineh Families of Black Mesa, Arizona & The Anpo 0 Project: Standing Rock Reservation School Supplies. Admission is $20 and will feature a buffet-style traditional indigenous people menu. 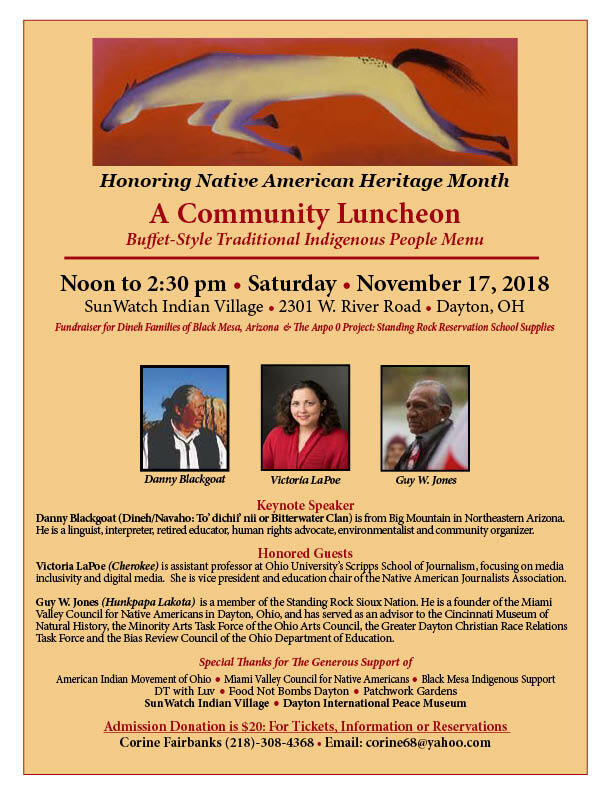 The luncheon will take place from noon to 2:30 p.m. at the SunWatch Indian Village, 2301 River Road in Dayton. For tickets or reservations, contact Corine Fairbanks at 218-308-4368 or corine68@yahoo.com.